Saint Theodore the Studite was born in Constantinople in 759; his pious parents were named Photinus and Theoctiste. He assumed the monastic habit in his youth, at the monastery called Sakkoudion, and became abbot there in 794. About the year 784 he was ordained deacon, and later presbyter by the most holy Patriarch Tarasius. On joining the brotherhood of the Monastery of Studium (which was named after its founder Studius, a Roman consul), the Saint received the surname "Studite." He proved to be a fervent zealot for the traditions of the Fathers and contested even unto death for the sake of his reverence for the holy icons. He endured three exiles because of his pious zeal. During the third one, to which he was condemned by the Iconoclast autocrat, Leo the Armenian, he endured courageously - being beaten and bound and led from one dark dungeon to another - for seven whole years. Finally he was recalled from exile by Michael the Stutterer. Receiving thus a small respite from his labours of long endurance, he reposed in the Lord on November 11, 826, a Sunday, while his disciples, who stood round about him, chanted the 118th Psalm. Some say that after receiving the immaculate Mysteries, he himself began chanting this psalm. And on reaching the verse, ' I will never forget Thy statutes, for in them hast Thou quickened me" (Ps. 118:93), he gave up his spirit, having lived for sixty-seven years. In addition to his other sacred writings, he composed, with the collaboration of his brother Joseph, almost the whole of the compunctionate book of the Triodion (see also July 14). Ascetic in truth and equal to the Angel's life, thy life was made bright with contests and martyric trials; and the holy Angels' companion was thou, Theodore, blest of God; now together with them, O Saint, thou ceaselessly prayest Christ in our behalf. 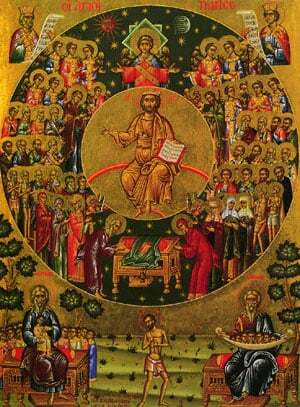 Share the feast of Theodore the Studite with an icon greeting ecard.